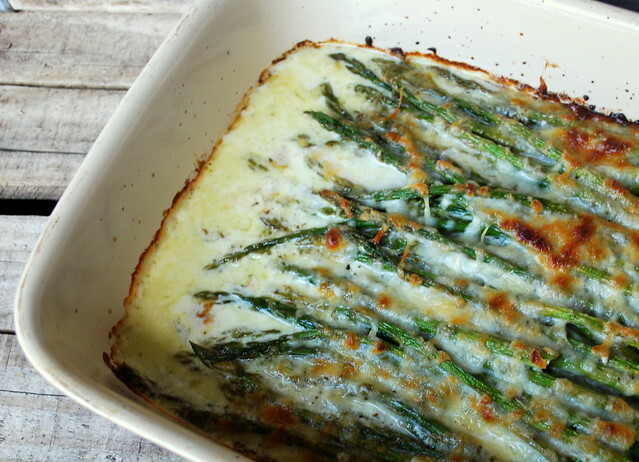 Say hello to our new favorite asparagus dish. We all love asparagus in this house and I use it whenever I can. I roast it in the oven with some olive oil and salt and pepper for most dinners or throw it on the grill in the warmer weather but every once in awhile I like to kick it up a notch and make something a little different. This creamy, cheesy dish is amazing! I've made it 4 times since I discovered the recipe. I doubled it for an AFC Football party, made it for dinner guests, made it again to photograph and I'm making another double batch for the Super Bowl. It really was a huge hit. There was never a stalk left! I adjusted the ingredients a bit from the original recipe. The Italian seasoning was a bit overpowering in the original and there was a tad bid too much mozzarella. Did I really just say that? Too much cheese? I did, lol. Preheat the oven to 400 and lightly grease an 8x8 baking pan or baking dish of similar size. Trim off the hard ends of the asparagus. 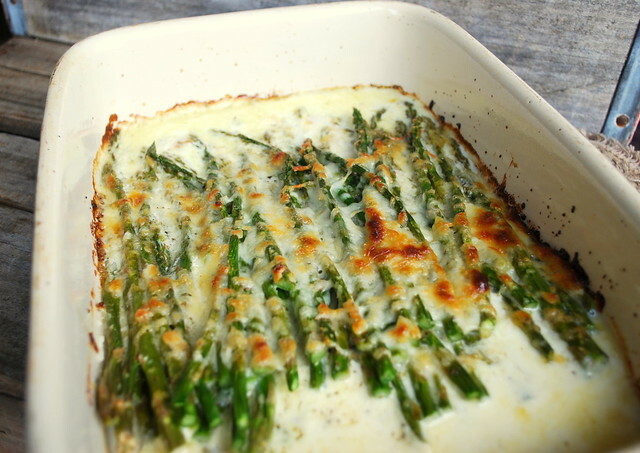 Place the asparagus into the baking dish and spread them out evenly. I used a 2 cup measuring cup, added the heavy cream, Italian seasoning, salt, pepper, and grated Asiago cheese in the cup and poured it over the asparagus. Spread mozzarella cheese over the top. Bake for 20 -25 minutes or until cheese is slightly browned and bubbly.